There must be a blue moon in the night sky, for how else to explain an appearance by the rarest of Stephen Sondheim musicals, Pacific Overtures? Despite the relatively high rotation of the riches of the Sondheim catalogue, Pacific Overtures has certainly slipped through the cracks in terms of gaining the awareness of a good many music theatregoers. Whether due to the challenges of the subject matter or staging requirements, this particular musical has just not inspired producers to take a risk, making this carefully considered production an even more gratefully received event. 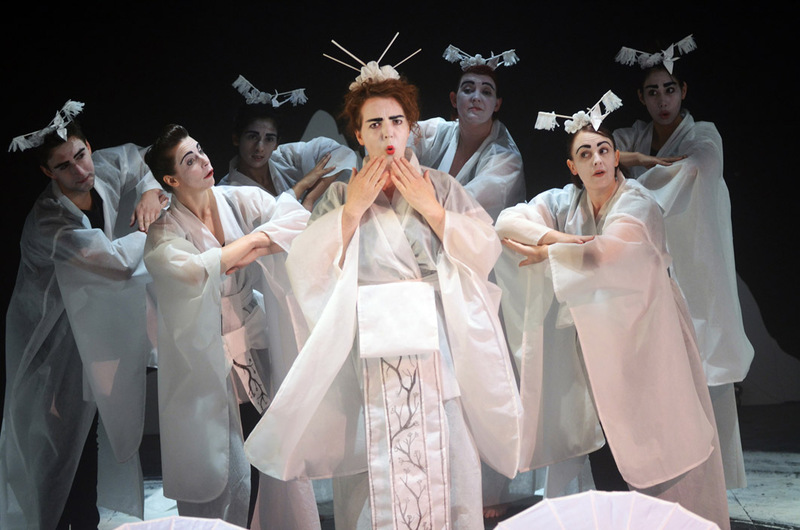 While the original Broadway season used an all-male, all Asian/Asian-American cast, to complement the kabuki staging, this version is ‘colour blind’ to both gender and race. Made up with white faces and black eyebrows, the cast come across as a troupe of players, working together to present this true ensemble piece, in which a performer can be a lead in one number then a chorus member in the next. Director Alister Smith has elicited focused, committed performances from the cast, achieving frequent moments of welcome humour. Given that this is an unfamiliar show, which many of the audience, myself included, will see for the first time, it is pleasing to note that storytelling is clear and easy to follow. The intimate setting certainly helps to create a bond between audience and performers. While not a dance show by any stretch, choreographer Michael Ralph has again demonstrated his signature strength for tight, inventive, character-focused choreography with particularly strong and interesting work in placement. Musical director Robyn Womersley’s efforts with the singing have allowed the fiendishly difficult score to sound natural and generally effortless. The four musicians sound like several more, with special mention going to Lara Wilson for bringing to life the fascinating range of sounds in the percussion score. While it is a pleasure to hear singers live without body mikes, the volume of singing at some times is not quite loud enough to listen to easily over the music; this balance may well improve as the season progresses. Designers Eugyeene Teh and Chloe Greaves have clearly worked closely to achieve a synergistic match between sets (Teh) and costumes (Greaves), in fact one could be excused for thinking the design was all by one person. Teh has painted a large ensō on the floor, with sheer white screens rising and falling to achieve an effortless flow. 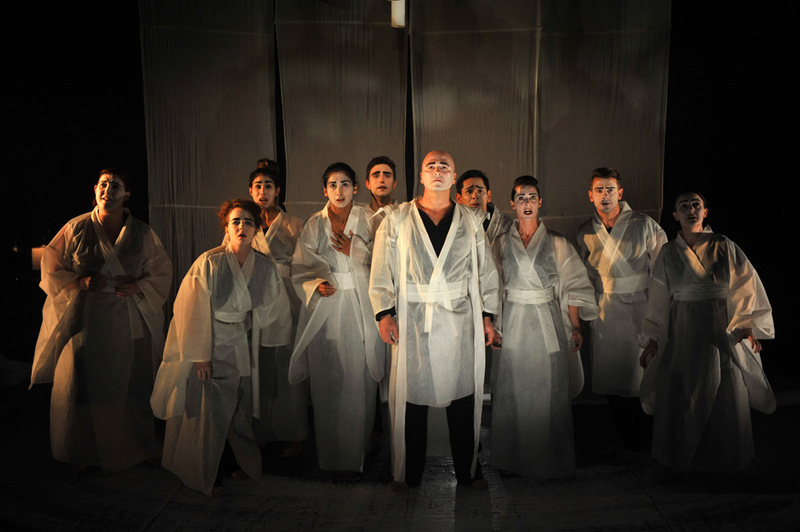 Greaves uses simple sheer white robes, enhanced with detailed headwear that helps to distinguish the range of roles played by the ensemble. Extra colour is added with the intrusion of other world nations into the cherry blossom serenity of Japan. Rob Sowinski’s lighting enhances the design, particularly the creation of shadow images. While a strong rear light is needed to make the shadows, it is often quite irritating to have it shining in the eyes of the audience. Overhead bamboo pole lights are cleverly lit in red and blue to signify the American presence in the second act. Anton Berezin uses his mellifluous vocal tones and gentle but commanding presence to excellent effect as the Reciter. Noni McCallum demonstrates her delightful flair for understated comedy, particularly in facial expression, playing a wild-haired soothsayer and a fretful councillor. As an opportunistic madam, McCallum nails the delicious number “Welcome to Kanagawa”. Adrian Li Donni and Nick Simpson-Deeks are well paired as east/west duo Kayama and Manjirō, with Li Donni’s doe-eyed countenance used to great effect when Kayama is thrust before the invading Americans. The pair gives a spirited rendition of gorgeous duet “Poems” on Kayama’s journey home, whereupon Li Donni lands a moving moment when Kayama makes a tragic discovery. Leighton Young has a strong and convincing presence in a range of roles. Sonya Suares shows her skills in conveying delicately expressive physical and facial gestures, gaining sympathy, in particular, for Kayama’s ill-fated wife Tamate. Berezin is joined by Leighton Young, Emma Clair Ford and Andrew Kroenert for “Someone in a Tree,” which is reportedly Sondheim’s favourite song from his great body of work. Act two feature number “Please Hello” shows Sondheim’s special knack for pastiche, with US, British, Dutch, Russian and French Admirals all singing in the style of their wittily stereotyped nationalities. Costuming and choreography add to the success of this number. The triple theatre ensemble is rounded out by Reece Budin, Tim Paige, and Elenor Smith Adams. Sondheim enthusiasts will certainly not want to miss seeing this production. 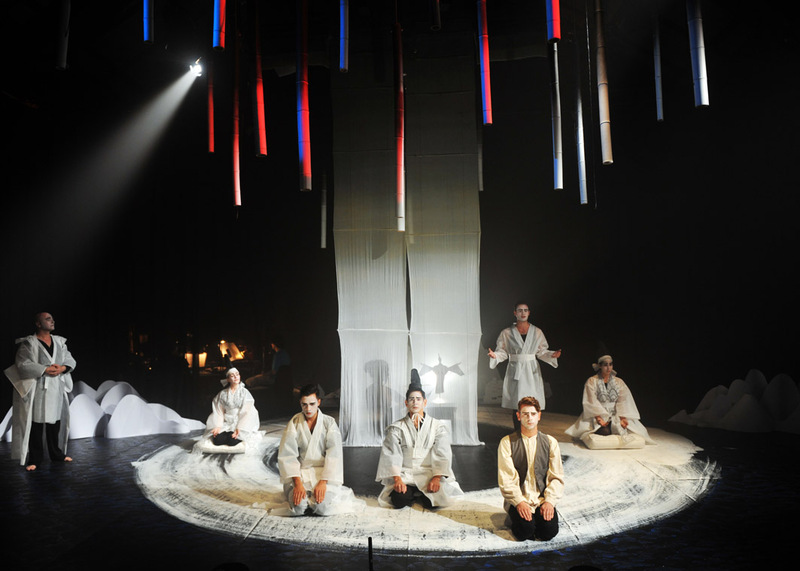 Pacific Overtures plays at Theatre Works, St Kilda, until 9 March 2014. This review published on Theatre People 21 February 2014. Not sure what happened Mark, Melbourne just went into a bit of a lull. There were some openings in Sydney but I couldn’t afford to go up there given my coming trip to Broadway (and my recent visit to the West End). More there to see in the coming weeks here though. Thanks for the tip regarding Machinal – sounds like it was an amazing production. Wish I could have seen it.